Born and raised at the base of the Catskill Mountains in New York, T.C. was raised in an active, outdoor family. This passion for nature would later define his photographic eye. An avid skier and hiker at Dartmouth College, his passion for travel and nature really took off. After graduation, T.C. purchased his first SLR camera and lenses and began his little “hobby”. His 8 years in film production (The Rat Pack, X-Files, Titanic, Broken Arrow, Hot Shots II, Tall Tale, Unstrung Heroes, Benny and Joon) afforded him travel to unique locations and allowed him to grasp the importance of light and composition. The self-taught photographer continued his artistic path by opening the L.A. Design Studio, where he entered the professional world of photography, web design and graphic design. His photography clients include Think Products, A.N. Abell Auction, Carl’s Jr (ISI), McDonald’s (ISI), Road Ready Cases and musical artist Rihanna. In 2008, T.C. 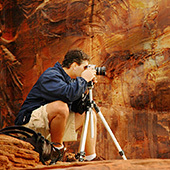 launched his nature photography with limited edition fine art photos (www.naturefineartphotos.com) and nature photo cards (www.naturephotocards). T.C. has embraced the digital darkroom and refines his imagery in photoshop. His goal is to reproduce the finest imagery that nature offers.